The epic conclusion to the Chaos Born trilogy is finally out! Torn apart by the horrors they have witnessed – and caused – the Children of Fire are more vulnerable than ever. The fanatical armies of the Order march across the land, trying to preserve the Legacy with a bloody Purge of any who have the ability to call upon the power of Chaos. And behind the Legacy lurks Daemron the Slayer and his armies of Chaos Spawn, eagerly waiting for their chance to be unleashed upon the mortal world. Like the other books in the series, there is some cool alternate UK cover art! Buy Chaos Unleashed in paperback, Kindle, Nook and audio formats. Available now in paperback, Kindle and other ebook formats! Learn more about A Minor Malevolent Spirit and Other Tales on my STORIES page! Read an excerpt from A Minor Malevolent Spirit and Other Tales here! WARNING: These stories contain strong language and scenes that may be disturbing for some readers. The Scorched Earth picks up right where Children of Fire left off. Grown to adulthood, the Children are in search of the ancient Talismans that can stop the return of Daemron the Slayer, ancient enemy of the Old Gods. But in acquiring Daemron’s Ring, they unleashed a flood of Chaos magic on the land—leaving death, destruction, and a vengeful queen in their wake. Now, beset on all sides by both mortal and supernatural enemies, they realize that their strength and faith will be tested as never before. And their greatest trial will be finding Daemron’s Sword, the last of the ancient Talismans, before the entire mortal world is engulfed in the war and Chaos that will herald the return of the Slayer. Like Children of Fire, there are alternate US and UK covers! The Scorched Earth is available is available in trade paperback, Kindle, Nook and audio formats. 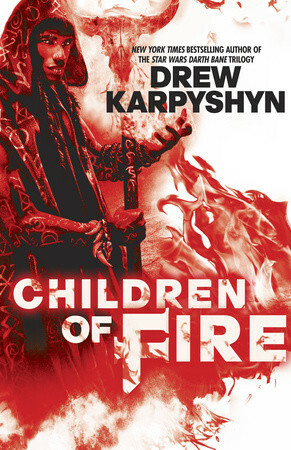 Children of Fire is now out in paperback! This is the first book of The Chaos Born trilogy, my new original epic fantasy series, and I can honestly say this is the best thing I’ve ever written. It even has cool alternate UK cover art! You can check out my Aug 16 and Aug 23 blogs for a quick two-part reader’s primer on the novel. And here are some recent interviews I’ve given about the book: FanGirl Blog; Roqoo Depot; Suvudu and my web interview from San Diego Comic Con. This is my homage to the great fantasy authors I read growing up, like Tolkien, Terry Brooks, David Eddings and GRRM, but written in my own unique style. The book is fast paced, with multiple point-of-view characters, lots of action and a bit of dark horror sprinkled over everything. Click HERE to get the official publisher’s blurb. Children of Fire is available in hard cover, paperback, Kindle and audio formats. This is my fifth Star Wars novel, and like the others before it has an Old Republic setting. 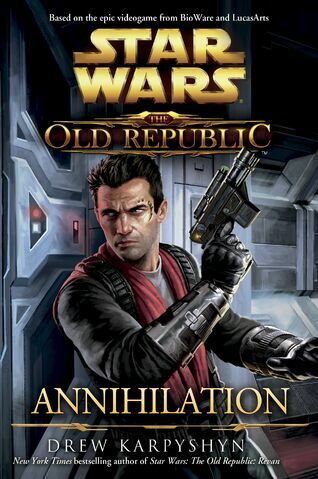 Annihilation has a few tie-ins with the Star Wars: The Old Republic online game, but it is a stand alone story. You don’t have to play the game to enjoy the book, and you won’t be lost or confused if you didn’t play the game. There are a few characters from the game that appear in the novel (Jace and Satele primarily), but the focus is on Theron Shan – an operative working for the Republic SIS. Theron was first introduced in the Lost Suns comic series by Alex Freed, and he’s very different from most of the other protagonists I’ve worked with in the Star Wars universe. For starters, Theron isn’t a Jedi; he’s not even Force sensitive. He’s a highly trained and deadly special agent, but unlike Revan or Bane, he isn’t one of the most powerful individuals in the universe. That means Theron has to rely on his wits and a little bit of hi-tech equipment to even the odds when he goes up against a Sith, which brings a whole different perspective. Theron was a really fun character to write; he’s not as grim or serious as Bane or Revan. He knows the stakes are high, but he’s got an irreverant vibe about him that sets him apart from some of my other characters. As much as I loved writing about all-powerful Sith and Jedi, I honestly think this book is my best Star Wars work to date because the character has to work so much harder to succeed. Available at Amazon in hardcover, through Kindle, in Audio and apple ibook formats, and through Barnes and Noble in hardcover and Nook formats. Also in paperback . Good news – the entire Darth Bane trilogy has just been released in a single ebook package, available for kindle, nook and apple ibooks. And all 4 Mass Effect novels (my 3 books plus ME: Deception by William Dietz) are also available in a single bundle for the kindle, nook and apple ibook. If you have an e-reader, it’s a great way to catch up on some of my older books. POSSIBLE MINOR SPOILERS!My fourth Star Wars novel, Revan, was released on November 15, 2011. The book continues the tale of the main character from the incredibly popular Knights of the Old Republic video game of 2003. (Created by BioWare, with yours truly as the Lead Writer.) Revan also focuses on the character of the Exile from KOTOR 2, as well as introducing key characters from the Star Wars: Old Republic MMO, including the Sith Emperor. If you’ve never played the KOTOR games, you will still be able to enjoy the novel, but you’ll probably get more out of the story if you read the plot summaries from KOTOR and KOTOR2 on Wookieepedia. There are appearances by other KOTOR characters in the novel, but I did have to leave some of them out of the equation. Revan’s relationship with his friends and companions is an integral part of the KOTOR experience, but a novel that included all of his companions – not to mention those from KOTOR 2 – would have had a ridiculously large cast of characters. Trying to squeeze everybody in would have meant nobody got enough face-time, so I had to pick and choose based on which characters fit in best with the story I was trying to tell. As you can imagine, this annoyed some readers who felt their personal favorites were left out. What can I say? You can’t please everybody. I should also warn you that Revan is a dark and even tragic novel – it’s not all rainbows and lollipops. This also angered some of the KOTOR fans, especially those who feel a strong attachment to Revan and the Exile. I knew that was a risk going in, but I felt it was necessary to provide some closure on the parts of Revan’s tale left dangling from the KOTOR series. Inevitably, someone was going to write this story, and I figured I was the best person for the job. Fortunately, most readers enjoyed the novel, even if things didn’t necessarily turn out the way they hoped. I hope you’ll enjoy it, too. Revan is available in audiobook, Nook and paperback at Barnes and Noble, Kindle, paperback and apple ibook formats. Released July 27, 2010, the third novel in the Mass Effect trilogy brings back Anderson, Kahlee, Grayson and the Illusive Man for a final – and brutal – confrontation. Like the previous novels, Retribution expands on the ME universe, fleshing out the setting and providing background on some of the key characters in the Mass Effect video games. However, it isn’t necessary to play the games in order to understand and enjoy the novels. Also available at Barnes and Noble and in kindle and audio formats. The third novel in the Darth Bane series hit shelves on December 8, 2009. (Which also happens to be my mother’s birthday – so Happy Birthday, Mom!) I know there’s a lot of confusion about the ending for this book. I was trying to be subtle and imply something; unfortunately, a lot of people are inferring something completely different than what I intended. That’s okay in some ways – it makes for good debate on message boards. However, if you want to know what REALLY happened with Bane and Zannah, then click on the SUPER SECRET SPOILER link. (But be warned – this gives away the ending! So don’t look until you read the book!) Also available at Barnes & Noble in paperback and nook and in kindle and paperback. Released in July of 2008, the second Mass Effect novel is set a few months after the events of the first Mass Effect game. It brings back the character of Kahlee Sanders from the first novel, and digs deeper into an organization known as Cerberus – a radical pro-human military cabal the player can encounter in the first game. The story also takes a closer look at the quarian species, biotic ability in humans, and introduces the setting of Omega – the Terminus Systems’ dark, twisted counterpart to the Citadel. Mass Effect: Ascension helps lay the groundwork for the ever expanding ME story and setting, but it won’t spoil anything from the upcoming second Mass Effect game. It does have some things that might be considered spoilers if you haven’t read the first novel or played the first game… so check those out before you buy it. Also available at Barnes and Noble and in kindle, paperback and audio formats. You can learn more about the novel from the official Del Rey listing (contains minor spoilers!). The sequel to my New York Times bestseller Path of Destruction, Rule of Two continues the story of Darth Bane and his apprentice, Zannah. This may be the darkest novel I’ve ever written – I was actually shocked at some of the stuff my editors let me get away with in the Star Wars universe. This book is definitely not for kids: it’s a mature, serious and hopefully compelling look at morality, evil and the dark side. Rule of Two hit the shelves December 26, 2007 in hardcover, and was on the bestseller lists for several weeks. It didn’t quite crack the top 10 on the NY Times list, though, topping out at #11. The paperback came out in October of 2008. Also available at Barnes and Noble and in paperback and kindle. Released in May 2007, Revelation is a prequel to BioWare’s Mass Effect game. Set 18 years before the events of the game, the novel focuses on David Anderson – a soldier with the human Alliancemilitary – and delves into his history and backstory. The novel also sheds more light on Saren Arterius, the main villain in the Mass Effect game, giving readers a deeper insight into what makes him tick. (That’s him on the cover.) I’m very excited about Revelation. Because it’s a prequel, I wasn’t locked into a simplified retelling of the story we present in the game. (See my write up on Throne of Bhaal below for reasons why this never really works.) Instead, I was able to focus on fleshing out the universe of Mass Effect by telling a story that will give readers a deeper understanding of the setting. I also give you a closer look at some of the key characters from the game, adding to the overall experience. It isn’t necessary to play the game to read the novel (or vice versa), because both the game and the novel tell their own unique story with enough details about the Mass Effect universe to stand on their own. I was also careful to avoid major spoilers so it won’t matter which story you encounter first. I’m confident Revelation will provide the kind of story Mass Effect fans will want in a novel – something that doesn’t negate their experience playing the game, but adds to the overall universe. Also available at Barnes and Noble and in kindle, paperback and audio. My first hardcover novel, it was published in late September of 2006 and released in paperback in June 2007. The hardcover spent 5 weeks on the New York Times Bestseller lists. Set 1000 years before the movie, the novel looks at Darth Bane, a pivotal figure in the history of the Star Wars universe. It was Bane who first proposed the Rule of Two – one master and one apprentice – followed by the Sith during the time of the movies. The book has been well received by both fans and critics. It spent 5 weeks on the New York Times Bestseller list, reaching as high as #11. It was also selected by the School Library Journal as one of the Best Adult Books for High School Students of 2006. Also available at Barnes and Noble and in kindle and paperback. This novel was the first one I wrote, though it was published simultaneously with Throne of Bhaal (below) in September of 2001. I think the novel is a great example of a stand alone Sword and Sorcery adventure yarn, and I’m very happy with how it turned out… and with how it was received by the fans. It’s out of print, but you can get it on kindle. This was the second novel I wrote, though it was published at the same time as Temple Hill in September of 2001. Unfortunately this novel never really clicked with fans. It was the third novel in a trilogy, but the first two books were written by a different author. That meant I was somewhat limited in what I could do with the characters because I had to stay consistent with what had come before. However, neither of the first two books really connected with fans, either. Throne of Bhaal is an entertaining story, but it just wasn’t what fans expected. I believe the problem with the whole Baldur’s Gate trilogy was that the novels were based directly on the story of the BioWare computer games (which I also worked on). Basing novels directly on BioWare games is difficult. The games allow players to create their own main character, but in the book we have to select a character for you. Players could be male, female, elf, dwarf, wizards, thieves – but in the book they were locked into a male human fighter. Obviously this makes it hard for them to identify with the main character. In the game up to a dozen different side characters could join with the player and share their adventures. In the book we had to select 3-4 side characters at most, and inevitably we left out characters players liked. One more problem – the game was 30 hours long and had over 500,000 words of dialog. Condensing all that into an 80,000 word novel is bound to leave players feeling let down. As if all that wasn’t bad enough the book had four different editors as Wizards of the Coast was going through a shake-up at the time, and I’m sad to say that is reflected in the quality of the novel. As a writer you’re too close to your own work to effectively edit it. You need a good editor to push your work to the final level of quality, and that didn’t happen with Throne of Bhaal. I still don’t think it’s a bad book: it does give a deeper look at all the various villains players will encounter in the Throne of Bhaal game. But the novel never become what I had hoped it would.